The 2015 Miss Chick stands with her court and the chairman of this year’s Poultry Days after the crowning ceremony Saturday afternoon. They are, from left, first runner-up Taylor Stover, daughter of Eric and Julie Stover; 2015 Poultry Days Chairman Brian Pearson; Miss Chick Christa Puthoff, daughter of Steve and Marlene Puthoff; and second runner-up Rachel Osterloh, daughter of Luke and Sharon Osterloh. Former Miss Chicks and Miss Chick court members share their best memories of their experience with the contest and during their reigns. The 10 Miss Chick contestants pose for photos while awaiting the results of the competition Saturday afternoon in the gym at the old high school. 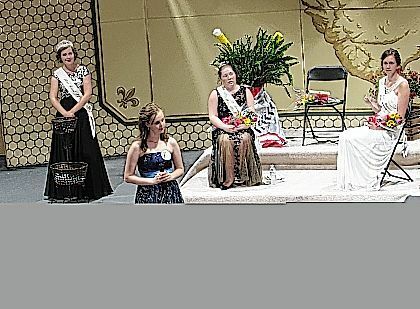 VERSAILLES — After a round of personal interviews and two rounds of questions for 10 candidates in front of a packed house at the old high school gym, Christa Puthoff was crowned Miss Chick for Versailles Poultry Days 2015 on Saturday afternoon. Puthoff is the daughter of Steve and Marlene Puthoff. She was sponsored by St. Denis Youth Ministry. Taylor Stover, daughter of Eric and Julie Stover, was first runner-up and was sponsored by Pohl Transportation. Rachel Osterloh, daughter of Luke and Sharon Osterloh, was second runner-up and was sponsored by Versailles FFA. Also competing for the crown were Morgan Turpen, daughter of Andrew and Paula Turpen, sponsored by Encore! ; Shayla Bertke, daughter of Mark and Sharon Bertke, sponsored by Performance Powder Coating; Megan Marchal, daughter of Mark and Elaine Marchal, sponsored by Mike’s Montes; Lauren Monnin, daughter of Ron and Jodi Bohman, and Dan Monnin, sponsored by Versailles Lady Tigers Basketball; Meladi Brewer, daughter of James and Tracy Brewer, sponsored by Brewer Electrical Sales and Services; Malinda Barlage, daughter of Tony and Kris Barlage, sponsored by Patterson Patchers 4-H Club; and Abbey Marshal, daughter of Jeff and Beth Marshal, sponsored by Versailles Feed Mill. Pageant judges Saturday were Calvin Rose, Hoosiermama? captain and Poultry Days Ultimate Community representative; Shawn Peters, 2014 Poultry Days chairman; Melissa Heft, Miss Chick 2007; and Eric Stachler, 2013 Poultry Days chairman. Master of Ceremonies was Keith Rawlins. Joining him on the floor were last year’s court of Elizabeth White, Miss Chick 2014; Courtney Rose, 2014 first runner-up; and Cassidy Condon, 2014 second runner-up. This year’s second day of competition, after Friday’s personal interview round, was changed, so that after the first round of questions, the field was not narrowed to five, and all 10 contestants had a second question to answer. Questions covered such topics as parental responsibility with kids and social media, the impact of Disney films on young women, the gender gap in wages earned, and the most important advice to give to a child.